After years of hiking in countless destinations, sometimes I feel a little jaded on the trail, as if experiencing something new becomes more and more rare. What was so great about hiking in the Sproul State Forest was that I realized there is still so much to see, so much that remains hidden. On my second hike in the Sproul, I led a larger group to the Clendenin Branch/Shoemaker Ridge Loop. After the exceptional hike to Round Island Run the day before, I didn’t think this one could top it. It proved to be equally beautiful. This loop is about 6 miles in length. This area of the Sproul is isolated, located at the eastern end of Shoemaker Ridge Road. The Chuck Keiper Trail passes a couple miles to the west. Here, numerous streams have carved gorges and glens down through the plateau as they flow to the West Branch Susquehanna River. The beauty of the Sproul is its streams, which are often pristine and feature spectacular forests of hemlock, rhododendron, and laurel. They felt primeval. These forests have cool, moist micro-climates and are home to great biodiversity. On this hike alone we passed many different kinds of mushrooms. Starting this loop was a little confusing but we soon found our way, following an old forest road through a scenic and diverse forest of pine and hardwoods with an understory of blueberry. This trail was also unblazed, but the route was obvious. The trail followed a narrow ridge under a nice pine forest. It was interesting to see both sides of the ridge fall away through the forest. The trail led to the end of the ridge with a view from a powerline swath. We backtracked to another obvious grade, now on our right. The grade descended into a beautiful gorge with lots of rhododendron. We soon reached Clendenin Branch at a campsite. The air was moist, cool, and had a sweet smell. What a beautiful place. The trail turns upstream, following an old grade along this gorgeous stream. There were many stream crossings, and some large pine and hemlock trees. We passed through a short section with stinging nettle, but they were not much of a problem. 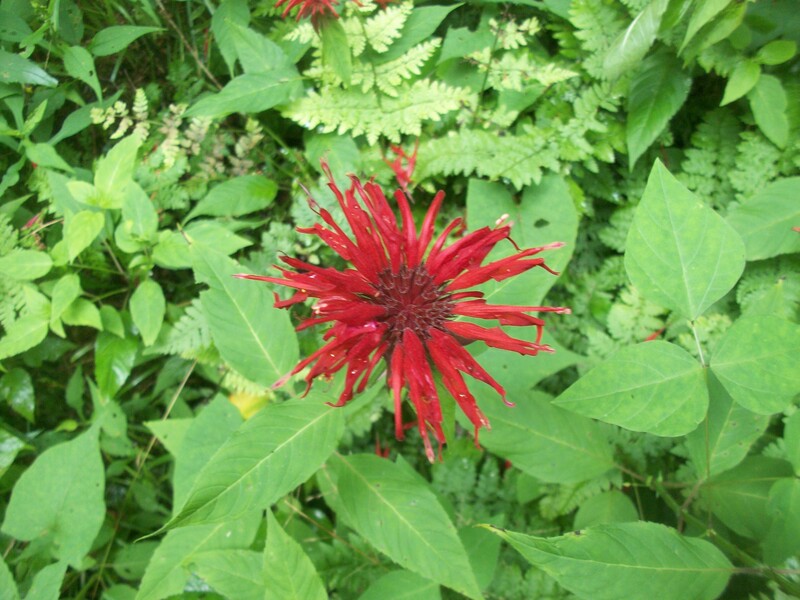 Soon thereafter was a patch of bright red bee balm. As we followed the creek, the scenery became even more beautiful as rhododendron crowded the trail with bright white blooms. These blooms covered the hillside. At Benjamin Branch there was another campsite in a stunning location, surrounded by streams, hemlocks, and more rhododendron. The trail continued upstream with multiple stream crossings. The gorge narrowed with larger moss covered boulders and cascades. The narrow trail threaded its way around boulders and logs in a jungle of green. In places, the trail hugged the side of the gorge above the rushing creek. We reached a small waterfall with a deep pool. The trail only got better as it entered a jungle of rhododendron passing a large boulder the size of a small house and a secret pool fed by a cascade. Clendenin Branch was simply stunning with its sublime scenery. We followed the trail up a steep climb away from the creek and reached the top of the plateau where we completed the loop. I will not soon forget this hidden gem deep in the Sproul State Forest. This trail is unblazed but is relatively easy to follow since it uses old forest grades. Keep in mind there are several stream crossings without bridges. I highly recommend hiking this loop counter-clockwise. A hike in early to mid July offers amazing rhododendron blooms. There are also two very nice campsites if you are looking for a short overnight backpack. Snakes are a common sight on the trail, although we did not see any on our hike. Stinging nettle was not a problem on this hike. 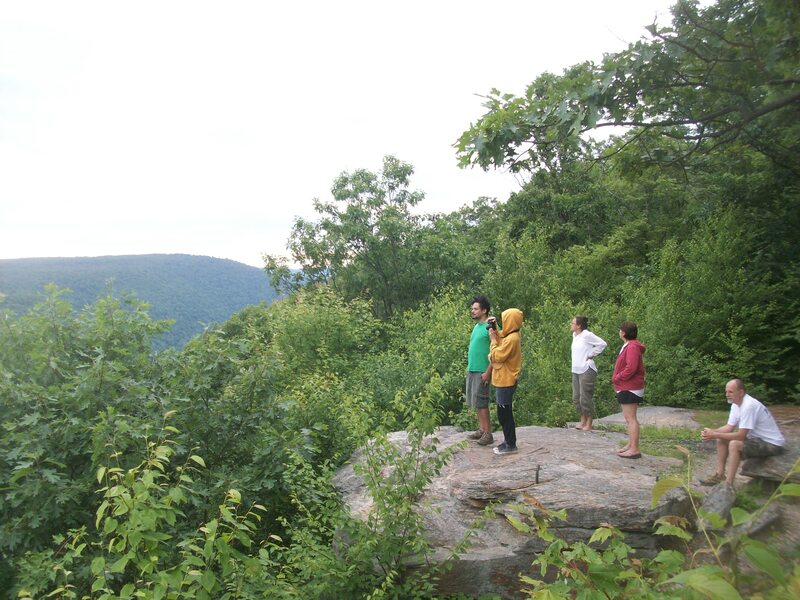 Every July, the Keystone Trails Association (KTA) hosts the Prowl the Sproul hiking weekend outside of Renovo where a variety of dayhikes are offered in and around the Sproul State Forest. I attended this year’s event, which is held at a local hunting club. 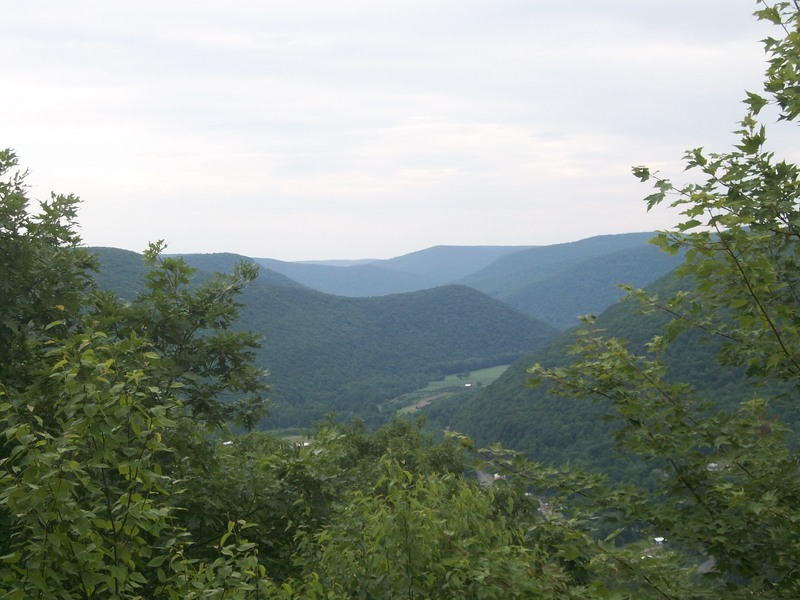 Sproul is the largest of Pennsylvania’s state forests, covering over 300,000 acres. And as I would soon see, it is one of the most beautiful. I had spent time in Sproul State Forest several years ago, hiking the Chuck Keiper Trail and parts of the Donut Hole Trail. However, I knew there was more to see. As it turns out, Sproul has some beautiful hidden gems. I was helping the KTA by leading two of the hikes. The first was to Round Island Run and its waterfall. I had known about the falls for a few years, but never had the chance to visit since it is located in a very isolated corner of the state forest, about an hour from where we were camping. We drove through Renovo along PA 120 and turned off in the isolated hamlet of Keating. Keating is a forgotten place, yet it is in a scenic spot, surrounded by mountains as the large Sinnemahoning Creek joins the even larger West Branch Susquehanna River. The group I was leading was filled with people who were interesting, fun, and excited to explore a new place. After parking our cars, we began by hiking down lonely Jerry Ridge Road to its end where there were two excellent vistas overlooking the canyons and steep plateaus. It was overcast, so the mist was rising, or hanging in the distant glens. It made the views spectacular. I was there the day before to scout the trail when it was sunny, so the change between the two days made it interesting. We began the loop by hiking the unblazed Jacobs Hollow Trail. The trail was easy to follow through ferns. Along the way we passed a huge garter snake that was about 2 1/2 feet long, the longest I have ever seen. I saw that same snake the day before. The trail reached the stream in the hollow and went down along an old grade. 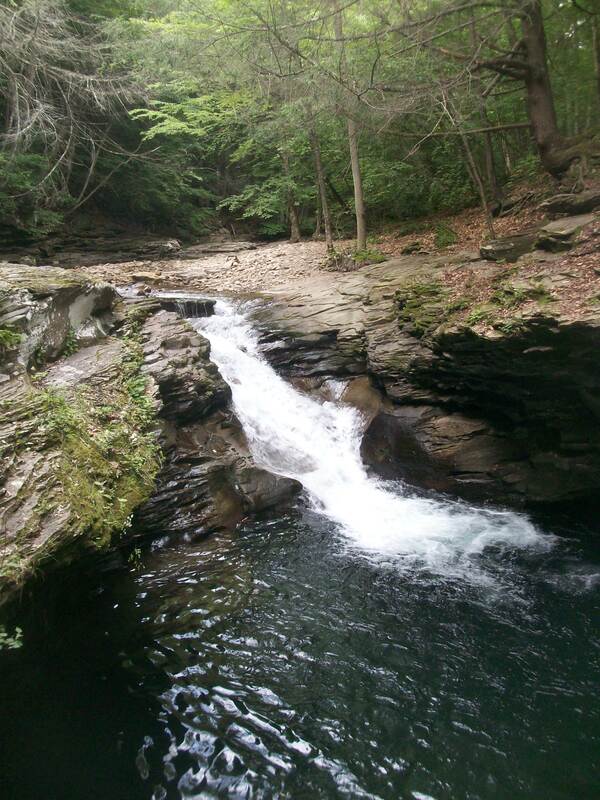 The hollow was very beautiful with cascades, hemlocks, and rhododendrons. Everything seemed lush, green, and covered in moss. Everyone commented on the beauty, but the best had yet to come. We reached the bottom and ate lunch at a pool fed by a small cascade. Blooming rhododendron surrounded us. George, one of the members in the group, found a heavy, circular piece of cast iron in the water. We couldn’t figure out what it was. Our hike took us up along Round Island Run and the beauty became incredible as we were surrounded by blooming rhododendron. White blossoms were everywhere, contrasting the deep, moist green of the forest. As I was walking, I looked down just in time to see a rattlesnake coiled up. It didn’t rattle or hiss. We tried to walk around it in the brush, but it soon slithered down the slope towards the creek. Round Island Run was simply gorgeous. It cascaded over moss covered rocks and ledges, framed by blooming rhododendron and green hemlocks. Brook trout sprinted in the clear waters below the trail. The place almost seemed primeval, as if we were on the set of Jurassic Park. As if things couldn’t get any better, we reached a place where the white blossoms covered the mountainside, reaching as far into the forest as the eye can see. Stunning. I had never seen anything like it. A side trail took us down to Round Island Run Falls, which drops about 25 feet. A few of us stood behind the falls. A campsite was near the falls. It was a beautiful spot, but the whole hike was so scenic, it is hard to call the falls the highlight. The trail continued upstream as hidden cascades tumbled in the rhododendron jungles below. We followed a trail as it climbed the steep slope, leaving the lush forests along the creek for the drier oak forests on the plateau. The trail became hard to follow, but we were able to make our way to another unblazed trail, where we turned left. The level trail meandered through meadows and ferns under hardwoods. We soon returned back to the cars. On the drive out through Keating we saw a sign that said “Nudist Crossing”. You have to love Keating. Despite the isolation, this trail is worth the drive. It is best to hike this loop clockwise. While the trail is not blazed, most of it is fairly easy to follow, with the exception of the southern part of the loop where the trail climbs from the stream and then turns left back to Jerry Ridge Road. This juncture is very easy to miss if hiking the loop counter-clockwise. As a point of reference, if you do hike this loop counter-clockwise and pass a wide ledge about ten feet tall, followed by thick blueberry bushes, you went too far. I was very much impressed by the beauty of this place. 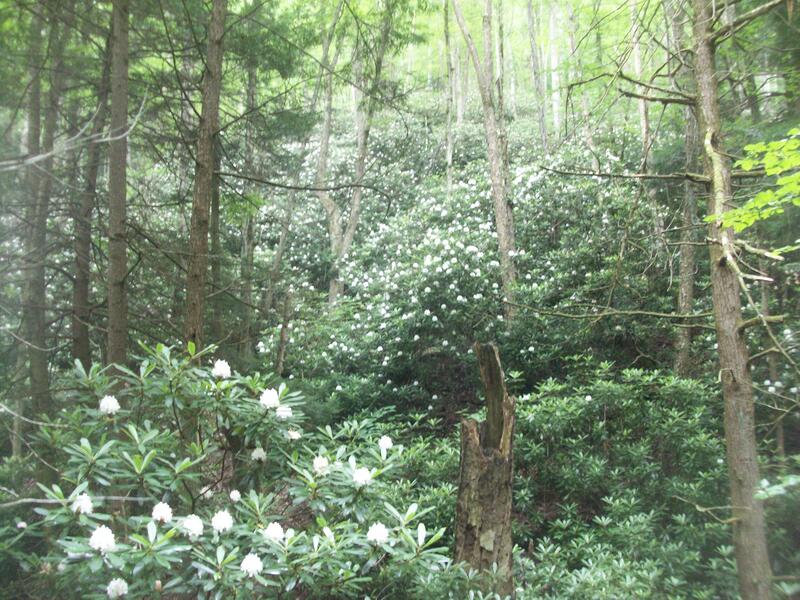 While the hike is scenic all year, it is particularly so when the rhododendron is blooming in July. My next hike in Sproul State Forest was to the Clendenin Branch/Shoemaker Ridge Loop, and it was not to be outdone. It was years ago. I drove up along a narrow, dirt road, not sure if my old Saturn sedan even belonged on such a road, so deep in the woods. I had heard of this place, Rock Run it was called. The stream was masked by trees, hidden deep in a gorge. I wondered if the drive was really worth my time. I found a place to park and a dirt path that threaded its way down to the water. I walked down, not sure what to expect. The path parsed some saplings and revealed Rock Run. As I saw the crystalline water flow over sculpted bedrock, only to disappear over a cascade into a chasm surrounded by ledges, I quickly realized it was more than worth my time. It captured my time. I have been back many times since and unlike other places, Rock Run never grows old, or tiring, or boring. It is a place set apart, harboring a natural beauty that is becoming more rare. While Ricketts Glen, Ohiopyle, or the Pine Creek Gorge are considered Pennsylvania’s “gems”, Rock Run is more than deserving of that title as well. And like the others, it is not protected. Pennsylvania, or maybe Pennsylvanians, has/have a poor track record when it comes to protecting our state’s superb natural beauty. Despite all of our public land, despite all of our “gems”, virtually none of them are truly protected. Not even our heralded state parks are safe. Everything has a dollar sign, because we allow it to be, and at times, demand it to be. Budgets cannot be balanced. Services cannot be cut. Taxes cannot be raised. Our votes demand dollars. Or maybe it is because we do not believe the places in our state truly deserve protection. After all, we can go out west, or down south, or to New England, or overseas. Is it the beauty in our backyards can be destroyed because it can be replaced by the amazing beauty in some other state or country? And this is where Rock Run proves us all wrong. I’ve been across the country. I’ve hiked in the typical famous places. Yet, Rock Run remains one of my favorite places. It illustrates the superb beauty in our backyards, the hidden beauty of Pennsylvania that only we can protect if we had the courage and pride to do so. Will we, finally, stand up for ourselves? A few weeks ago, I returned to Rock Run. And with me I brought others, because my appreciation alone is no longer enough. We took the same path I did many years ago. We ate lunch on a bedrock island surrounded by water so clear it seemed invisible. They were all converted. The water dashed down a cascade into an aquamarine pool carved into the rock. Electrified ripples danced across smooth stones several feet below. The creek separated towering cliffs that rose over us and tumbled along boulders before surging through a narrow bedrock channel with deep, oblong pools. We reached what I call the “Bubble Pool”, where a narrow, powerful current creates a shower of bubbles into the crystal clear pool. It was like looking at sparkling water. We were mesmerized by this simple wonder. 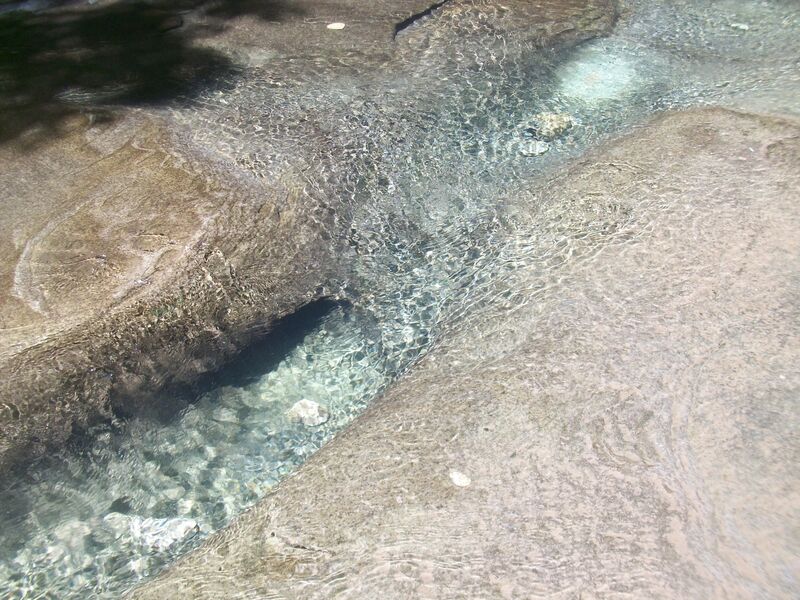 Rock Run is famous for its pools, sculpted into solid bedrock. There are dozens of them. 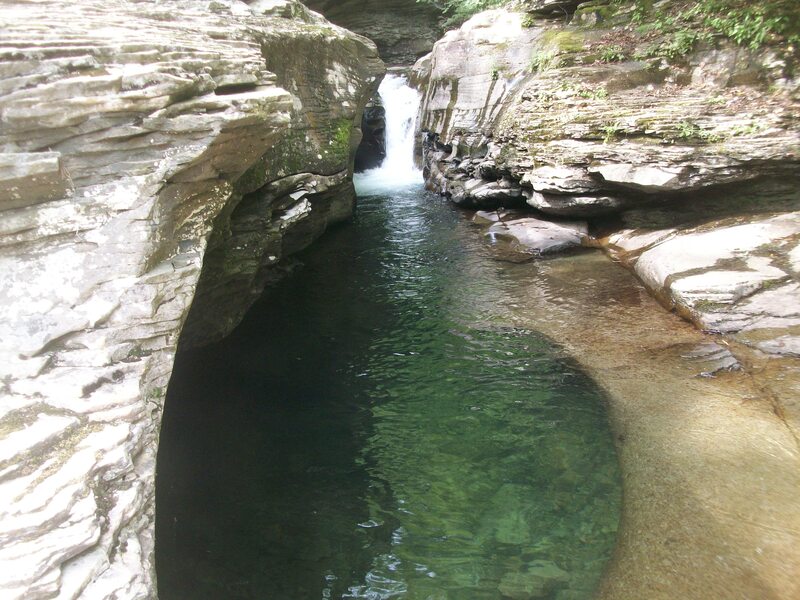 Backpacker magazine once noted Rock Run as having some of the best swimming holes in the country. Rock Run is special because its beauty lingers for miles, with constant pools, slides, cascades, channels, and chasms. Cliffs and ledges often rise up and over the creek. Springs pour from cracks in the rock. Side streams join with tumbling waterfalls. Our hike lead up upstream, passing popular pools were people swam and relaxed. Despite being July, the water was frigid and people did not seem to stay in the water long. Trout lingered in the depths. We passed boulders that were smooth to the touch, rounded by eons of floods. In places, the bedrock was eroded with wavy fins and potholes you could step across, but not stand up in and still have your face above the water. The gorge narrowed as cliffs encased the creek. We were able to walk on a wide ledge just above the water, but this ledge gradually disappeared until it stopped at a fractured cliff. We had reached a chasm. I scrambled up to the top and helped the others. Despite their trepidation, everyone scrambled up the cliff and to the top of the chasm. A trail brought us to a waterfall that fed a deep pool, completely embedded within cliffs. This amazing pool held light deep into its depths. We returned to the cars, passing tributaries with waterfalls and gorges of their own. The green hardwood forest rose above with the last emerald light of the day. I decided we should drive up to Band Rock in the McIntyre Wild Area. The rock is so named because bands would play there and the people in the valley could hear the music. It is also the site of McIntyre, an abandoned mining town. Despite almost a century of time, you can still tell this place had been mined. Nature has done a valiant job healing this landscape, but the old cuts, culm piles, tailings, and grades are not so easily erased. The coal once brought jobs, money, and opportunity, but like all booms, it ended. However, its consequences remained for generations. Ironically, all that now remains of McIntyre is its cemetery hidden in the forest, invaded by trees. Each generation does not learn enough from the one prior. If you visit Rock Run, please treat it with respect. Rock Run has grown in popularity, which may be the primary reason why there is now an effort to protect it. Camping is not allowed along most of the stream. Do not limit your exploration to Rock Run alone. 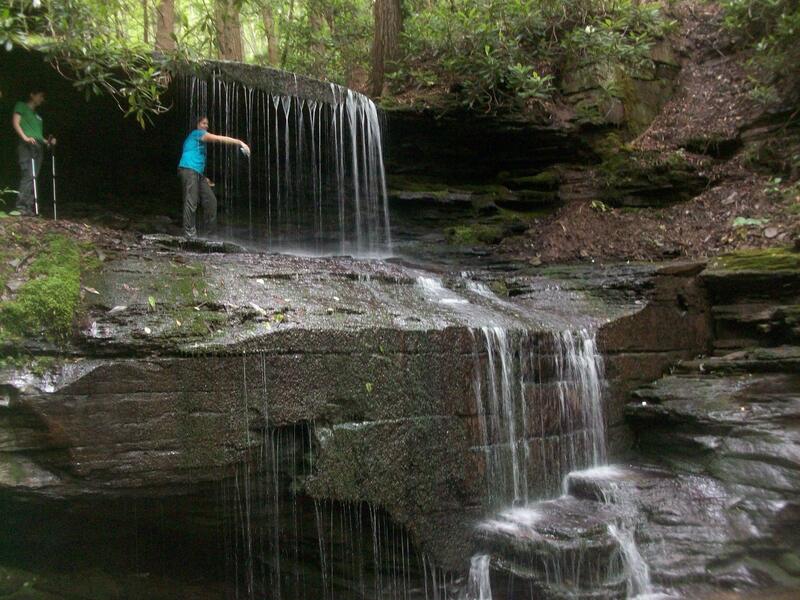 Miners Run is incredibly beautiful with many waterfalls, a narrow gorge, and huge boulders. Hounds Run also has a waterfall, as does Doe Run. 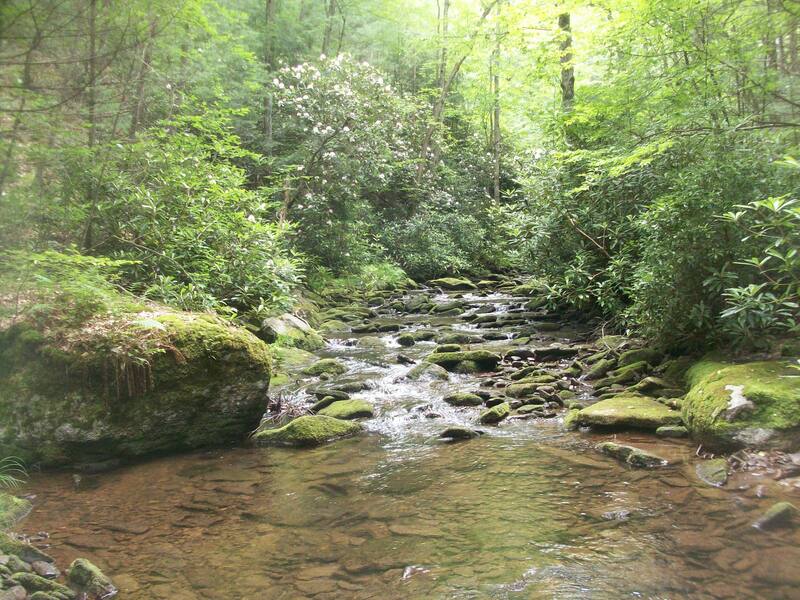 Rock Run’s amazing beauty continues all the way up to where the run’s two branches meet. 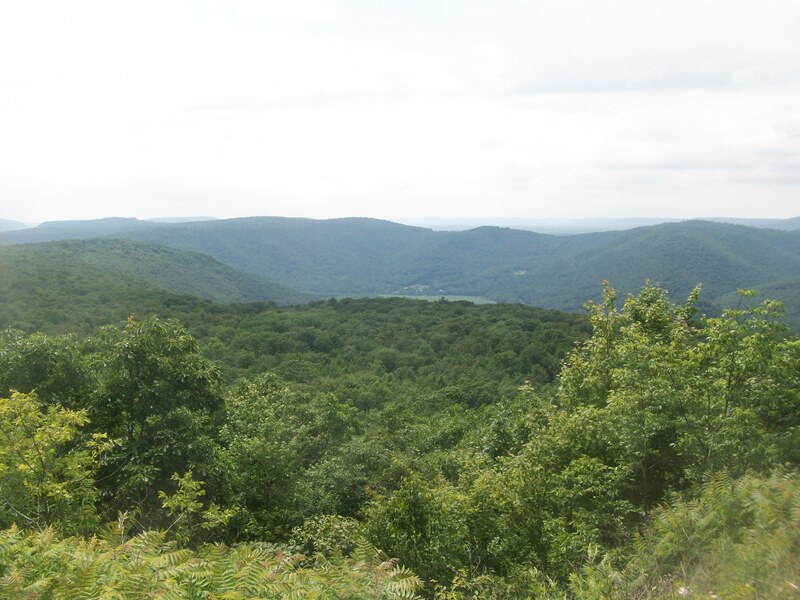 Various Rock Run area hikes are described in hike numbers 57 – 66 in Hiking the Endless Mountains. Rock Run is unique for all of its incredible recreational qualities. 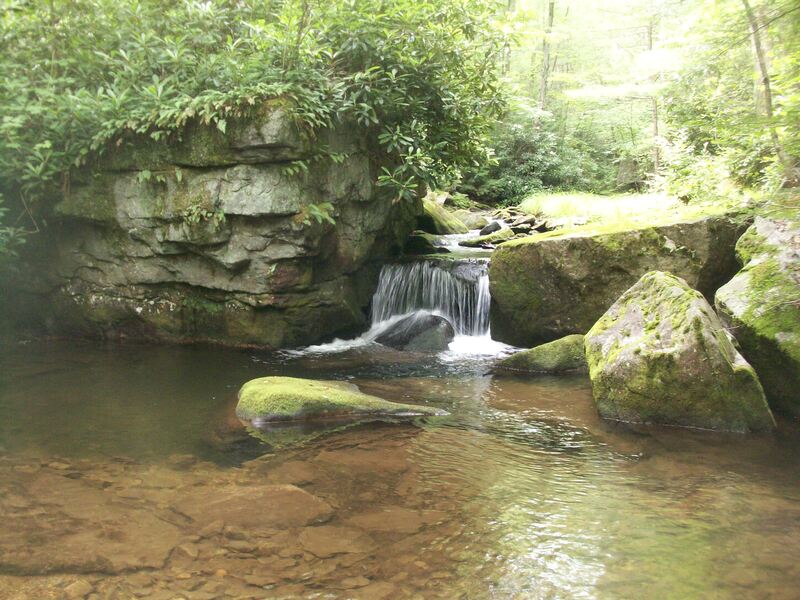 People come here to rock climb, hike, whitewater kayak, fish, swim, and hunt. The Old Loggers Path, one of the state’s most beloved trails, explores a section of Rock Run. An ideal weekend trip is to car camp at the primitive campground in Masten and then hike a section of the Old Loggers Path, or drive a short distance to Rock Run. Masten is the site of an old logging town, now reduced to a few cabins. The primitive campground is located in a spruce grove that was the site of a Civilian Conservation Corps camp. This is one of Pennsylvania’s most beautiful places, and there are many more. How to get to Rock Run. 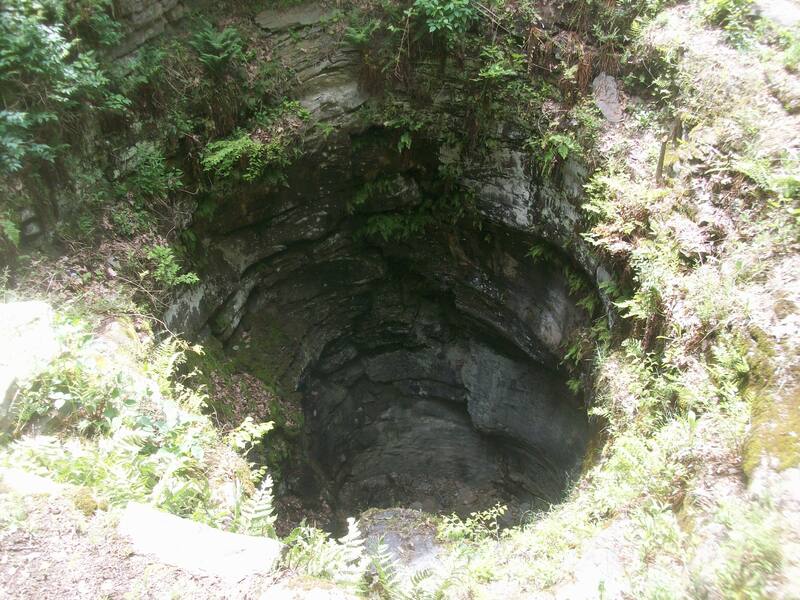 If you find yourself near Jermyn or Archbald and have ten minutes to spare, consider a quick visit to the Archbald Pothole State Park. This small park is home to this unique geologic feature, which is almost 40 feet deep and over 40 feet wide. A viewing platform hangs out over the pothole. The pothole is located right next to the parking area. Glaciers formed the pothole thousands of years ago; the melting water plummeted to the ground and eventually carved out the pothole. This is considered to be one of the finest glacial potholes in the world. There are no streams located near the pothole itself. The surrounding woods have a lot of rock ledges and there are unofficial trails, but the primary attraction is the park’s namesake. 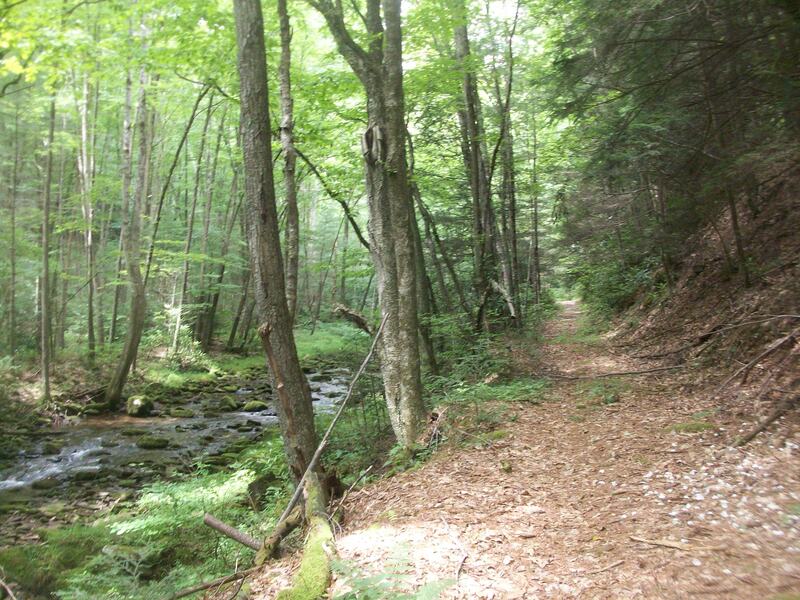 I used to spend a lot of time in the Loyalsock State Forest. I would look over maps, find trails, and start hiking. Over the years I’ve hiked most of the trails in the state forest and along the way I’ve seen secret waterfalls, hidden glens, cliffs, and beautiful forests. There was many a night when I would drive back home on Route 87 in the dark, caked with dirt and sweat, my legs sore and aching. As the years passed, I gradually spent less time in the Loyalsock. I was off exploring new areas, or attending to chores at home. However, I still missed the Loyalsock. Even after hiking in places like Yosemite, the White Mountains, and Zion, the Loyalsock remains one of my favorite places due to its unique and subtle beauty. It is without question one of the most scenic public lands in Pennsylvania. I recently returned to the state forest to see some of its hidden ponds, as well as its vistas. 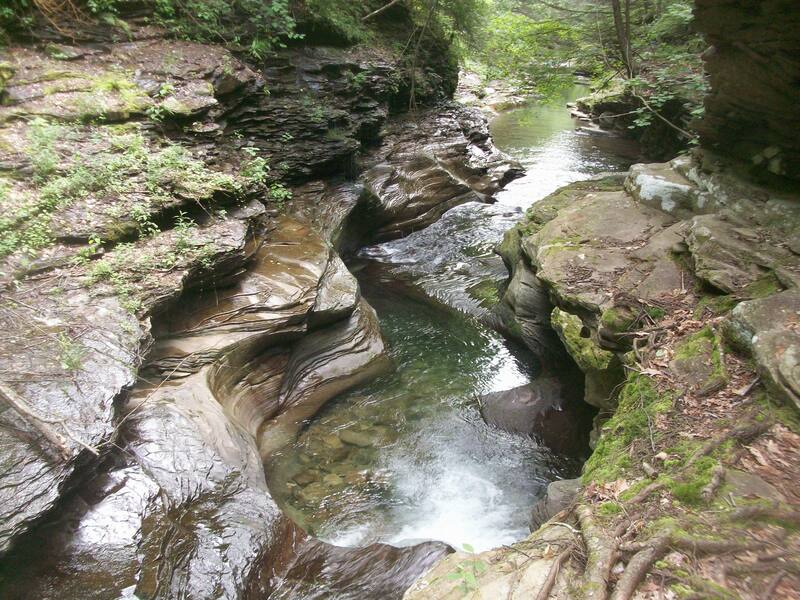 The Loyalsock is unique in that there are several ponds embedded in the forest and most are at least a little ways from a road. My first stop was to see two wildfowl ponds at the headwaters of Double Run. I parked my car and hiked in on an old woods roads through a stunning hemlock forest. Rays of sunlight penetrated the dark forest to electrify a few younger trees in the understory. I still had some trauma from a recent Adirondacks hike where I was viciously attacked by black flies and mosquitos and I half-expected a smilar assault when I stepped in the woods. Besides a few pesky deerflies, I was left alone. The grassy trail took me to the first pond, which covered about 15 or so acres. There was open water and lots of standing scags. It was a beautiful and serene place. On a calm day in the fall it would be spectacular with all the reflections. I hiked further to another, smaller pond that was just as scenic, and larger than I expected. Yellow lilies were about to bloom and several frogs were croaking. I then drove out to High Knob Overlook; this view never disappoints. The rolling green ridges melted into the distant haze. Next was a small pond off of Big Hollow Road. This pond was only a few acres in size, but nice nonetheless. The deerflies were a little more assertive at this pond. I then drove to Big Hollow Pond, probably my favorite. This untouched pond is surrounded by forested ridges and hemlock forests. Unlike the other ponds, most of the surface was free of lilypads. I then drove up to Bearwallow Pond where several people were fishing. A road passes this isolated pond with its stumps and lilypads. A visit to Hoagland Vista as the sun began to set followed. The vista looks down on the Hoagland Creek gorge. My final stop was to sublime Hunters Lake, located adjacent to the state forest. This lake is a kayaker’s and angler’s dream with its clear waters, untouched shoreline, and beautiful views of the mountains. A beautiful day in the Loyalsock State Forest.